This mod will allow the player to harvest, loot or search for items, ingredients, gold and is fully configurable. 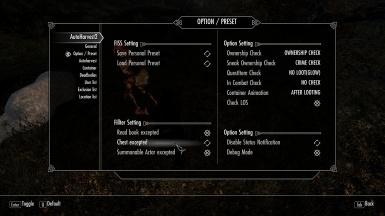 For greater immersion there is an option to use a spell to harvest or the mod can be set to automatically harvest within a defined distance. preset added in option page. Container.HasTimeController() added. This function can make sure that the container has open or close animation. It will reduce the possibility of CTD. Created the new method of AutoHarvest task . Test build for Improvement of stability. max radius changed. 2000 to 1000.
fix mcm script bug. (when FISS is not loaded). I hope fix. fix quest item bug of mcm script. add "player house" to location setting. fix los check section of dll. ** It is necessary to make clean save, or play the new game. Because scripts was remake to correspond to MCM. The clutter list priority changed as high as possible. enchantment item/alchemy value fix. ** This is calculated value , it is approximate. moved the item 'los check' of MCM. EnableInCombat , EnableDrawWeapon option added. EnableInCombat changed to DisableInCombat for clarity. EnableDrawWeapon changed to DisableDrawingWeapon for clarity. This mod is an experimental by towawot. And, I have published the results. This mod will allow the player to harvest, loot or search for items, ingredients and gold and is fully configurable. For greater immersion there is an option to use a spell to harvest or the mod can be set to automatically harvest within a defined distance. There is an option to add items not usually harvested like kettles or items from another mod. 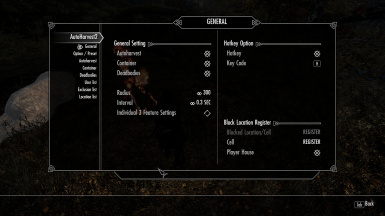 This mod uses the MCM or Mod Configuration Menu. To find it: click Escape in-game and you will find it below Save and Load on your menu. 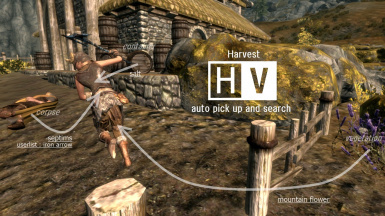 Auto Harvest Section- Configuration options for automatically harvesting "enabled" items that are exposed and not in containers or bodies. Turn on Auto-harvest here (or use the alternate section for the "Harvest Spell"). Enable or disable items you want harvested by ticking the appropriate boxes. There is an option to click everything. For USER LIST information see separate section listing below. Container Section- Use this menu to turn on or off automatically harvesting from barrels/containers/chests/urns and dressers/wardrobes/end-tables. This is a separate operation. This will harvest the items enabled here by ticking the boxes. For USER LIST information see separate section listing below. DeadBodies section- Use this menu to turn on or off automatically harvesting from dead bodies. Note that the bodies must in fact be completely dead in order to work. This will harvest the items enabled here by ticking the boxes. For USER LIST information see separate section listing below. User List section- This menu is for MANAGING items you, the user, added to be harvested. 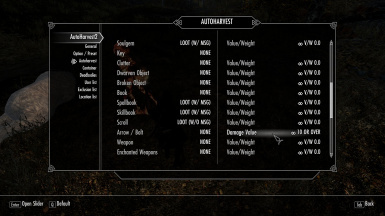 These may be items not yet added to the main mod or added by DLC or another mod you are using. You have room for 128 items. Once registered items can be enabled or disabled here. Press hotkey to pause or restart autoharvest and loot. or hold down the key for a few seconds for adding it to exclusion list.